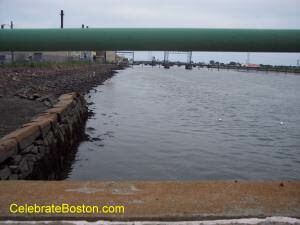 On February 27, 1879, a mysterious trunk was found floating in the Saugus River near Lynn Massachusetts. The trunk was discovered in shallow icy water, with a human hand protruding from its top. Inside was the mutilated body of a young woman. The woman's arms and legs were contorted to fit inside the trunk, and her nose was cut off in an attempt to prevent identification of the body. The trunk also contained two empty champagne bottles, and several bricks to sink the trunk to the bottom of the river. This incident was one of the most gruesome and tragic murders in greater Boston history. This sensational crime made national headlines, and was referred to as the Mystery Trunk murder case. The man that found the trunk thought it was just a piece of wood floating in the river. He noticed the human hand, and retrieved the trunk from the water. A police investigation was quickly launched and an autopsy performed. The medical examiner determined that the young woman had died from an abortion. She had a large abdominal wound, and had died about two days earlier. Abortion was illegal in the state at that time, making the case even more sensational. It took three weeks to identify the body, which led to the Mystery Trunk reference. "After months of detective work, and failure of some professionals, the case has at last been cleared up by the aid of a newspaper reporter, and the parties concerned in the death of Miss Jennie P. Clark have been taken into custody. It was more than three weeks before it was proved beyond reasonable doubt that the girl was Jennie P. Clark of Boston Highlands. Until the body had been identified little could be done toward discovering the authors of the crime. Time and money was freely spent by detectives and reporters in following up clue after clue, but for days without success. It was ascertained that Jennie left her home in the family of Mr. A. at the Highlands on the afternoon of February 12th. She was last seen on a Mt. Pleasant street car. The girl lived in the family of Mr. A. for a number of years and was kindly treated. That gentleman and his wife professed to have no knowledge of Jennie's whereabouts after she left in February. In response to inquiries about the girl's character, only good words could be heard. Her friends and acquaintances all spoke of her as a pure and modest girl, against whom there could be no breath of suspicion. But persistent efforts to ferret out the guilty parties culminated in the arrest of five persons on Tuesday, charged with being principals or accessories in the crime. Briefly stated the facts of the case, as show by evidence recently obtained, are as follows: Jennie Clark, having been betrayed at the Highlands, was taken to a house of crime on Lagrange Street, and afterwards died from the effects of criminal malpractice at the hands of two villains, who had the remains packed in a trunk and thrown into the Saugus river. A detailed statement of her sufferings and death, and those of other unfortunates in the same trouble, make the most starling and horrible revelation. The parties arrested and charged with being principles or accessories in the crime are Mrs. Caroline C. Goodrich, 21 Lagrange Street, Dr. Daniel F. Kimball, a Miss and Mrs. Smith [identity concealed] at South Somerville, and [Mr.] A., Jennie Clarke's employer at the Highlands. Sufficient evidence was procured by the inspectors to warrant the arrest as above stated. Their theory is that Jennie Clark went to Dr. Simond's at Lagrange Street, that the operation was performed there by Dr. Kimball, and she was taken to South Somerville, there died, and her body having been mutilated by the same 'doctor' she [was] packed in the trunk and taken to the river. The Smith women on being arrested made a clean breast of the whole affair. They say that Jennie Clark was brought to their house and there died from the effects of an abortion performed by Madam Goodrich and Doctor Kimball. One of the women says that Doctor Kimball cut off the nose with a pair of forceps. Among other pieces of evidence found by the detectives, is the ownership of the checked gingham shirt, that being directly traced to the parties who placed it in the trunk. The Dolly-Varden tablecloth was also traced to the same house, and journeys of the trunk, by which the two express labels were put on to it, have been learned." "The facts of the case, as they are related by Mrs. Smith and corroborated by other testimony, are, that that on the 12th of February last, when the Clark girl left her home in the Highlands, she went direct to the house of Madame Goodrich, and there abortion was performed, and she remained for a few days, and on the 15th of February left Boston for the house of the Smiths. Shortly after her arrival, she was delivered of a fetus, and for a while exhibited symptoms of [medical condition illegible]. Soon, however, her illness took an unfavorable turn, and on the 25th she died. Dr. Kimball and Madame had previously been notified of the turn matters were taking, and the doctor went to Somerville, arriving there shortly after Jenny's death, and assisting in packing up the body, first with a pair of dentists forceps cutting the nose off the dead girl. The body of Miss Clark was then put into a trunk, and on the following evening Kimball carried it in a buggy in the direction of Lynn. He was unable to sink it as desired, as most of the streams were frozen, but on reaching Fox Hill bridge, on Saugus river, he put it overboard through the rails. This is the substance of the story of the two nurses of Jenny Clark, as told this morning to the detectives." On October 24, 1879, Caroline Goodrich and Doctor Daniel Kimball were found guilty of performing an abortion. Dr. Kimball received six years in the State Prison, and Madame Goodrich received 10 years in the House of Correction.